The little town of Guardamar Spain, lies about 15 kilometers north of Torrevieja. Following the national road N332 up in northern direction. With about 10000 habitants Guardamar (also known as Guardamar del Segura) is one of the very well known places along the Costablanca. The city is famous for its about 10 km long beach, which is pine forest enclosed. Lying very close to the beach, the city often got large blast of sandstorms within the years. Therefore it had been decided to plant a large forest alongside, which is now known as the dunes of Guardamar. Attracting an enormous amount of wildlife over the time, the area is now an environmentally protected area. The created area is the smallest natural park in Spain called Park Alfonso XIII. Together with the little park of Reina Sofia close to the city center, Guardamar is really a wonderful place to totally relax and enjoy a perfect day. To the left, next to the beach, the dunes of Guardamar, with its pine tree forest at the national park. 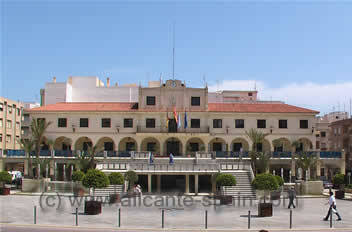 The city hall at the city center. 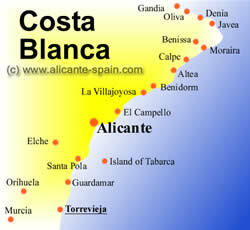 Many tourists take short day trips north to visit Alicante, the salt lakes of Salinas de Santa Pola or the shopping area of Gran Alacant. The Dunes of Guardamar – with its pine trees and palm trees to protect against the sand. 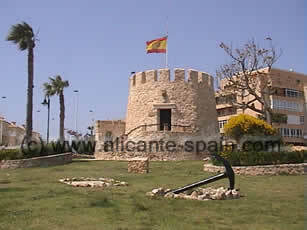 Today Guardamar’s main tourist attraction is the long sandy beach with its wonderful pine trees and palm trees along. Together with the warm Guardamar weather, its the perfect place for sunny and pleasant holidays. And for those of you who prefer a nice round of golf, the nearby area of Rojales and Algorfa offers two of the finest Costa Blanca golf grounds for Guardamar visitors.